We take the security, privacy & confidentiality concerns of our customers very seriously and have taken adequate steps to ensure that the confidential information of our customers is kept secure. Do you want to outsource your business processes, but are security concerns stopping you from outsourcing? 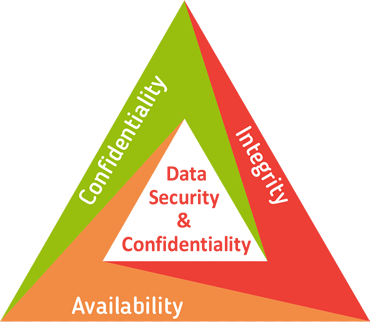 Outsource to Josoft Technologies and stop worrying about the security of your data. At Josoft, we take the security, privacy & confidentiality concerns of our customers very seriously and have taken adequate steps to ensure that the confidential information of our customers is kept secure. Training on security: All the employees at Josoft are given training on security, privacy and confidentiality. Absence of external drives: We have disabled all the external drives in the systems at Josoft Technologies. Limited access to data: At Josoft Technologies, we store our data at a data center and have installed physical access limitations to the data. Encrypted data: All the data that is transferred from our customers' office to our office is encrypted to ensure that none of the data is deciphered. Electronic devices are not allowed: The professionals at Josoft are not allowed to bring laptops, PDAs or any other electronic device into our offices. Paper/printed documents are not allowed: Our employees are not allowed to bring in or take out any paper, printout or written documents without permission. Confidentiality agreements: The employees at Josoft sign confidentiality and non-disclosure agreements at the onset of a project. We ensure that the professionals and administrators at Josoft who have access to sensitive information have signed the required confidentiality agreements. Firewalls & Antivirus software: All the systems at Josoft Technologies have antivirus software and firewalls. The systems are updated with virus definitions on a daily basis. We conduct technical evaluations on a routine basis to ensure that all the systems in our office meet the necessary security agreements. Password protected systems: All our employees use passwords to logon to their computers. This system prevents unauthorized access to data. Every professional at Josoft Technologies is given a unique user ID and password when accessing customer data. Security Measures: All the offices of Josoft Technologies have security measures to prevent the vandalism or theft of any information stored in our systems.